In the first part of this blog series on Bloom’s Taxonomy, the usefulness of Bloom’s levels in the context of online learning were explored and some of the reasons why we use this tool at GetSmarter were explained. The first two levels of Bloom’s, Remember and Understand, were also unpacked. In this second part, we will begin to explore the next two levels of Bloom’s Taxonomy, the Apply and Analyse levels. As discussed in Part 1, traditional approaches to education have focused on building a strong theoretical understanding for students, mostly through the use of didactic instructional tools. The more interactive, practical uses of this knowledge often get less attention. If we follow the analogy of learning a musical instrument once again, this would be like learning how to read musical notes, and understanding musical theory, without ever picking up the instrument. It seems intuitive that this would not be a successful way to learn. In addition, in an increasingly globalised and competitive world, the more practical, applicable workplace skills are paramount to success, making the importance of these higher Bloom’s levels more apparent. Apply – Use existing knowledge to solve new problems or apply acquired knowledge in new situations. Analyse – Examine and break information into parts to explore relationships. In instructional design, the term “scaffolding” is used to describe the process of learning incrementally. In the same way that a scaffold builds up to higher levels, relying on the foundational support structures to keep the upper levels steady, so too do the levels of Bloom’s “scaffold” learning up to the level of “Create”. Once the student has mastered the higher-level verbs, the scaffold can be “removed” and new skills can be built up from that point. The purpose of the Apply and Analyse levels is to shift students away from a purely theoretical, cognitive understanding of a topic, and into a more applicable and practical use of knowledge, without making the jump directly into creation. This assists the students in gradually developing a clear competency in a certain area, especially when given the correct guidance through scaffolded learning, or peer interaction. For GetSmarter, this is particularly useful because our promise to students is that they will develop verifiable competencies that are directly applicable to their work and career. However, any student will find it challenging to move directly from “Understand” to “Create” without having seen some examples of theory in practice, or having had a chance to apply the theory to a given case or example. This is the function of the middle levels of Bloom’s Revised Taxonomy. Figure 1: Bloom’s Revised Taxonomy. One of the most easily recognisable examples of a learning outcome pitched at the Apply level is the classic mathematical problem, “Solve for x”. The student is asked to “Solve for x” in this example. This is a direct application of the Pythagorean theorem and demonstrates clear practical use of the theory which they encountered on the previous levels of Bloom’s Taxonomy. In this example, the student is required simply to apply new knowledge to a given scenario, the extent of their thinking not going beyond procedural skills. However, once students begin to move beyond “Apply” and into “Analyse”, the metacognitive skills become more involved. Once students reach the “Analyse” level, they are required to rely less on theoretical knowledge for answers, and begin to think more conceptually, strategically and creatively. This is often referred to as “higher order thinking” or metacognitive ability. The Analyse level is meant to transition students from simple application to more complicated forms of application, prompting them to think laterally or strategically. From this list of verbs it is clear that “Analysis” is about more than procedural or conceptual knowledge and requires the application of theory to a higher level of thinking. To continue with the earlier example of Pythagoras, we may imagine an engineering student who is working on plans for a bridge. They would now need to think not only about how to calculate the length of the sides of a triangle, but also whether or not the Pythagorean theorem is at all applicable, or even whether structures using right-angled triangles are the most sound. It is at this point that decision-making based on theoretical understanding becomes important – beyond simple calculation. An example of a learning outcome may be to “Examine the structural integrity of a given bridge design” and then to “Criticise the use of right-angled triangles in the structure, using the Pythagorean theorem to calculate this”. The “Apply” and “Analyse” levels play a central role in moving students beyond theoretical knowledge to more strategic and creative ways of thinking – an important bridge to the higher order “Evaluate” and “Create” levels. It is at this stage that students are carefully transitioned from relying on factual and procedural knowledge, and begin applying their knowledge. During this transition period, it is important that Instructional Designers and educators are thoughtful in their choice of relevant case study examples and manageable exercises that will prepare students for practical thinking in their own work. The third and final part of this series will deal with the highest order verbs on Bloom’s Revised Taxonomy: “Create” and “Evaluate”. Determining the true goal of a good education is difficult. Should an accumulation of knowledge be sufficient to justify a qualification? Want to gain certifiable expertise from world-leading universities? View over 60 online short courses from the GetSmarter course portfolio. E-Learning Faculty. 2015. Scaffolding Learning for Novices, Amateurs, and Experts. Available: http://elearningfacultymodules.org/index.php/Scaffolding_Learning_for_Novices,_Amateurs,_and_Experts [2016, November 21]. Iowa State University. 2016. Revised Bloom’s Taxonomy. Available: http://www.celt.iastate.edu/teaching/effective-teaching-practices/revised-blooms-taxonomy [2016, November, 21]. Krathwohl, D. R. 2002. 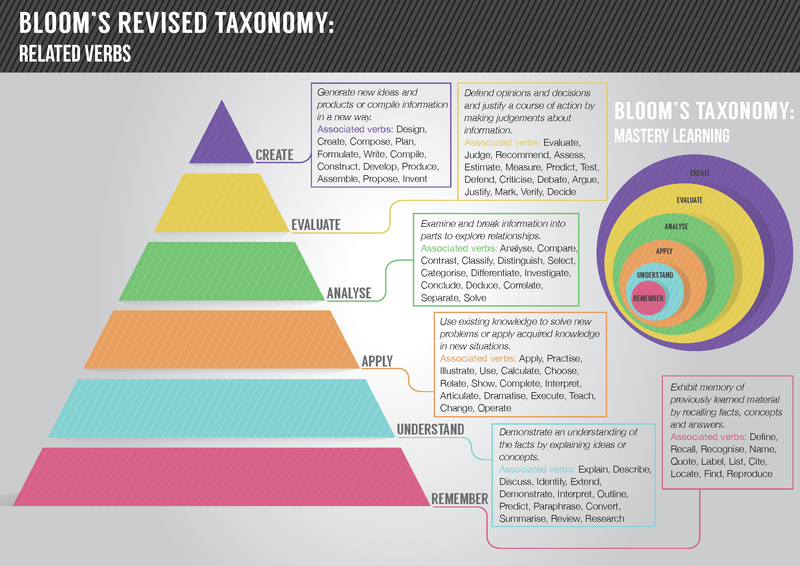 A revision of Bloom’s taxonomy: An overview. Theory into Practice, Vol. 41 No. 4. Available: http://rt3region7.ncdpi.wikispaces.net/file/view/8+Perspectives+on+RBT.pdf [2016, November 21]. McLeod, S. 2010. Zone of Proximal Development. Available: http://www.simplypsychology.org/Zone-of-Proximal-Development.html [2016, December 15].